What a great worship experience we had this week! The sanctuary was decorated with flames blown by the “Wind” , we had a special sung confession and other music for the day, and people wore red! What a joy it was! Add the Confirmation of Alex Peth and Benji Peth, with a reception after the service, and it was a day to remember! God, you have blessed Zion so much! We thank you for your steadfast love for us. Amen! Author pastorPosted on May 25, 2010 Categories UncategorizedLeave a comment on Pentecost Blessings! The Evangelism Committee is having a pork dinner fundraiser. Youth are in charge of the carwash. All monies raised will be used to help with evangelism at Zion. We need everyone’s help to make this a success! Tickets for boxed dinners will be for sale before the BBQ for $7.00. I had never camped in a cemetery before. A circle of orange tape was stretched a respectful distance from the headstones, setting the boundary between the living and the dead. We arrived late, and pitched our tent in the dark, outside the circle – on the living side. In the morning, the rising sun broke over the pines and spilled out over the tents, perched like so many butterflies in a colorful ring around the graveyard. The shadows from the headstones ran long fingers through the wet grass, beckoning us to come and read the names engraved on them; Jones, Hannah, Vechorik. It was oddly comforting, peaceful and calming, to breathe in your mortality with your morning coffee. You could not take the gift of another day of living for granted when you awoke to the visual reminder that it could have been otherwise. I watched the shadows shorten as the sun rose in the sky, and thought about my breathing. I thought about how fragile my hold is on this earthly life; how I was but one breath away from being on the other side of that bright orange tape. Yet, I was surprisingly okay with that. Because, I could feel the Divine power and purpose behind my breath – the Presence of God within – sustaining my body, renewing my mind, inspiring my soul. God wasn’t just wasting his breath. I was alive and breathing because God wanted it that way. I rested in the knowledge that my breath would not fail me until God said it was so. On the first Pentecost, the Fiftieth day from the resurrection of our Lord, Jesus fulfilled his departing promise to his disciples. He sent them the Comforter – the Holy Spirit. The Breath of God rode on the wings of the wind, descending on them in tongues of flame. God sent forth his breath, and they were transformed. They became God’s Church, and through them, God renewed the face of the earth. God, the Creator, is creating, still. In and out, in and out, his rhythmic breathing continues to sustain his world, bringing order out of chaos. And, we, his church of today, continue to breath deeply – to take in the Holy Spirit – to be filled with the Divine power and purpose that God set in motion at the forming of the world – that all might come to know and love him. We are living, breathing proof that God is not just wasting his breath. Through us, God continues to renew his world, and our work for him will not be done until God says it is so. Come! Join the flame-filled, joyful, living and breathing community of faith called Zion! Discover the Divine power and purpose within yourself! Find the reason behind your next breath! Rest in the knowledge that the God who holds the universe in his hands, also holds you! It is hard to believe that we have only three weeks of school left. Our last day for Children’s choir will be May 12th. We will continue to sing through May 30th. During the summer months, we will have some specials using the younger Sunday School children and the children’s choir singing with them. Thank you to our Children’s Choir members who have faithfully come to practice on Wednesdays and sang at the Sunday Worship Services. To the congregation, we thank you for the prayers and support you gave the choir during the year. We will have a pool party in June to honor our children for their dedication in singing at church. We hope you have a fun and safe summer! We are still in the Easter season, and this picture of our Living Cross is a joyful reminder of the hope we have in Christ. Thank you, Jesus, for loving us so much! 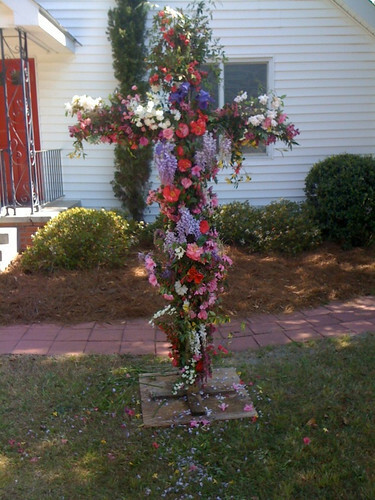 The Zion tradition of filling a cross with live flowers picked from our gardens to make a Living Cross reminds us that we follow a living Lord! Jesus is risen indeed! Alleluia! Author pastorPosted on May 4, 2010 Categories UncategorizedLeave a comment on He Is Risen! Lutheran Services of Georgia – Linda Larson is in need of cribs, bassinettes, strollers, car seats, and money for several young girls who are going to have babies or have recently had them. Call Norma Ralph at 912-313-2465 for more information or for donations. Thanks to everyone who helped with the preparation and cleanup with the Sunrise Breakfast. Special thanks to all who came out to enjoy the service, meal and fellowship. Congratulations to graduating seniors Michael Allard, Melissa Lowe, Mikell Ogle, Erin Pack, Ryan Pittman and Katherine Ralph. We wish you all the best and pray God’s blessings as a new chapter in your life begins. Please note, on Sunday, May 16th, we’ll be honoring all graduates during the 11am worship service. Sunday School Convention Youth are encouraged to attend Sunday School Convention starting at 10:00am at the Methodist Campground in Springfield. All churches in Effingham County are invited to be a part of this special day. There is special music, a guest speaker and each church shares a song with the group. Following the service, all of the Lutheran churches in Effingham have been invited to share a covered dish picnic lunch together. After lunch, we’ll lead games for any children, youth and adults who wish to participate. If you need transportation, contact Dana Lee. Youth Bible Study Come join us for the last Bible study of this school year. This is going to be a fun night! Bible studies will resume after school starts again in the fall. “Special Project” We need all youth to attend Sunday School to help with a very special and worthwhile project! It’s a surprise!! Pork Dinner Sale & Carwash The Evangelism Committee is having a pork dinner fundraiser. Youth are in charge of the carwash. All monies raised will be used to help with evangelism at Zion. We need everyone’s help to make this a success! Graduate Recognition Sunday All high school and college graduates will be recognized during the worship service. Confirmation Make plans to join us as we celebrate the Confirmation of Alex and Benji Peth. This is a special day and all youth are asked to come and show your support.